Real-time strategy fans that need a break from the PC might have a new PS3 title to look forward to in Under Siege. Seed Studios has posted up a good amount of details about the upcoming Under Siege on the PlayStation blog. Under Siege is a real-time strategy game being developed specifically for the PlayStation 3 but with all of the features you'd expect from a PC RTS. The progression of Under Siege's single-player campaign, which Seed calls "juicy," is said to differ from that seen in a game like StarCraft where a base must typically be built from scratch before much can get done. Instead of base management, players begin with an army, and money to train new squads is earned through winning at combat and completing other tasks. Squads level up, so you'll want to keep them alive to use in future battles. 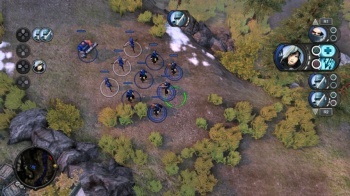 Also differing from the typical RTS is that a player's army is made up of every race in the game, instead of just one with its own specific abilities, which Seed says makes for an interesting time in multiplayer. As for multiplayer, up to four players can compete online in 1v1, 2v2, 3v1, or 4 players versus the computer. Surprisingly, two players can also duke it out locally in a split-screen mode. Seed says that just about any kind of multiplayer mode will be possible, and the game will ship with Deathmatch, Capture Point, Capture Treasure, and Survival maps. The reason Seed Studios believes anything is possible in Under Siege is because it's taking a cue from LittleBigPlanet and including the same level editor it used to create the game for players to use. The developer is saying that users can share their created maps with other Under Siege players around the world, meaning they should be playable in multiplayer. Under Siege's control scheme is being developed specifically for the PlayStation 3 controller, so we'll have to see how that turns out. The studio is also implementing support for PlayStation Move, which Sony has said is actually better for real-time strategy games than a mouse and keyboard. We'll definitely find out if that's true when Under Siege hits. The game will be exclusive to the PlayStation 3 and sold as a download through the PlayStation Network this fall.